Feta and fresh goat cheese are somewhat similar in appearance and texture, but that is where the similarity ends. As the name would suggest, goat cheese is made entirely from goat's milk. 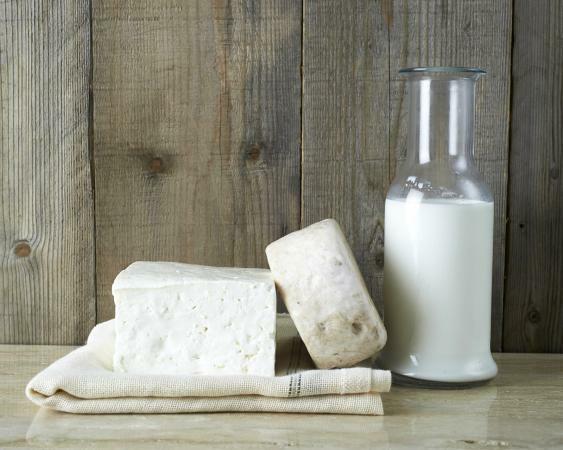 While feta cheese sometimes has a percentage of goat's milk in it, it is made primarily from sheep's milk. As a result, these two cheeses do not taste at all alike. Feta cheese is a salty, crumbly cheese that is featured in Mediterranean cuisine, especially Greek dishes. According to Cheese.com, traditional feta cheese is made from 70% sheep's milk and 30% goat's milk. However, it is not uncommon for feta to be made solely using sheep's milk. Some cheesemakers have attempted to label cheese that includes cow's milk as feta, but that is not correct. According to to Cheesemaking.com, "Feta cheese in 2005 secured a protected designation of origin in the European Union, and is defined as having a minimum of 70% sheep's milk, with the rest being goat's milk." Feta cheese has a long tradition of being made in Mediterranean countries where it is required that feta be aged at least two months. Just like the milk content is checked to make sure that the cheese can be classified as feta, the amount of time the cheese has been allowed to ripen is also checked in order to ensure that it can accurately be called a feta cheese. The actual name 'feta' comes from Greek, meaning 'a slice or a morsel,' and feta cheese is closely associated with many Greek dishes. Many recipes calling for feta cheese are variations on Greek salads, which often feature feta and olives, or variations on cooked feta, such as what has come to be known as Spanakopita, a Greek puff pastry filled with feta cheese, spinach, and spices. Unlike feta cheese, goat cheese is made from 100% goats' milk. The cheese is often referred to as chèvre, which is the French word for goat. Soft goat cheese (also referred to as fresh) does not require aging. Many variants of goat cheese are ready for consumption very soon after the cheese has been formed and salted during the goat cheese making process. Hard goat cheese and brined goat cheese, which are less common than fresh, do require aging, with some being aged for a month and others having three months or more to mature. According to the American Goat Dairy Products Committee, "Few goat's milk cheeses are aged more than four months and freezing can cause loss of quality." Generally, the longer the goat cheese is aged, the stronger the flavor of the cheese becomes. When in France, it is a delight to explore the many varieties of goat cheese that are some of the favorite French cheeses. Trying both young and aged goat cheeses provides a very different experience of the taste; if you're buying goat cheese in a shop where there is no shopkeeper to advise you on flavor, remember that the outside rind of a goat cheese becomes progressively darker with age. If you'd like a young goat cheese, choose the whitest rind you see; the darker rinds have more mature cheeses inside. While both of these cheeses are white in color and on the 'soft' side of the cheese spectrum, their flavors are actually quite different from one another. While the dominant flavor most people experience in feta cheese is "salty, sharp and tangy," goat cheeses are usually experienced as soft and sweet in flavor. Of course, different varieties of goat cheese (aged different lengths of time) have different flavors; however, aging goat cheese will not make it taste saltier. Instead, the flavor will become stronger in aged cheeses, but stronger in complexity, not in saltiness. Both feta and goat cheese can be eaten cold or hot. Experiment with different types of recipes for these two delectable cheeses and you're sure to find ways to you enjoy both!